D'ANJOU - Balloon shaped fruit of medium to large size. The skin is light green and turns yellow when ripe. The flesh texture is buttery and granny. ABATE FETEL - Squash-like elongated fruit with long neck, this pear is quite irregular in shape. Thin and smooth skin ranging from a light green to a yellowish color with a light pink hue when exposed to the sun. Its flesh is consistently white of fine texture. It is a juicy fruit with a neutral taste. BARTLETT - Medium-sized or larger and a few minor scuff marks. The colouring will be light-green to completely yellow. 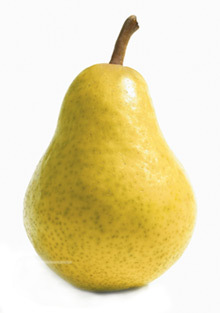 Bartlett pears are ripe when they turn completely yellow and give off a sweet aroma. 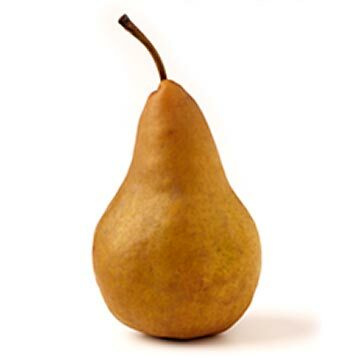 This pear bruises easily when ripe. medium size; long grain and irregular flat base. when ripe for consumption. The flesh is white yellowish, somewhat smooth and grainy towards the centre. GOLDEN RUSSET BOSCH - Discovered in the USA, Orignated as a Beurre Bosch mutation. Oblong green-yellow pear turning to yellow which accentuates the golden colour. Cream coloured flesh, slightly coarse texture, rich and syrupy. Harvested early February. WINTER BARTLETT - Fruit of medium-large size. The skin is thick, dull light green evenly. Noticeable protruding sparkles and yellowish when ripe. The flesh is somewhat creamy, very juicy, sweet and with great flavour. PECKHAMS TRIUMPH - Fruit with a wide and short base of medium to large size. 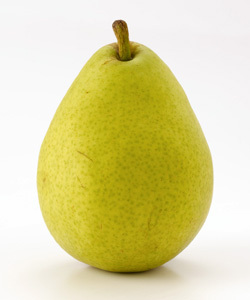 Sin is light green and turns yellow when ripe. The flesh is creamy white, of smooth texture, aromatic, juicy and slightly sour. RED BARTLETT -This variety can vary in color from a light red vertical striping over a green background to a dark, solid maroon. As they ripen, Red Bartletts will brighten to a clear, strong red, as the green background pigments change to yellow, just as they do in the green Bartlett variety. In the western United States, Red Bartletts are harvested August through September.